Patch pockets are entirely external, which makes their construction easy to visualize. However, they are not the easiest kind of pocket to make - the inseam pocket is. It is, literally, a pocket sewn into a seam. Because they are entirely internal/hidden, they might appear a little intimidating, but -hah - you're going to love how simple they actually are! Q Where are they found? Where can you put them? A Wherever there is a seam in a garment! They're great for the side seams of things like gathered skirts, pinafores, trousers - wherever you want a pouch into which to tuck your hand but don't want the pocket itself to be visible. They're the teeny coin pockets in the waistbands of men's tailored trousers, the concealed pockets in the insides of trenchcoats (the sort in which secret agents hide sheafs of Very Important Document or in which villains stash weapons) and the princess seams of winter coats (sometimes with a decorative flap on the outside). They're everywhere! Q So they can be used on any garment? A Yes. However, when they are positioned in the side seams, they are most effective in roomier garments. This is because hands will be shoved in them, and you'll want some room for that! I wouldn't put them in skin-tight pants or pencil skirts where they might gape open if I overate. Not that I wear skin-tight pants, I mean. Er, at least they don't start off being skin-tight. Enough talk - let's get started! Decide how big your pocket pouch needs to be. I often draw around the wearer's hand with some allowance. 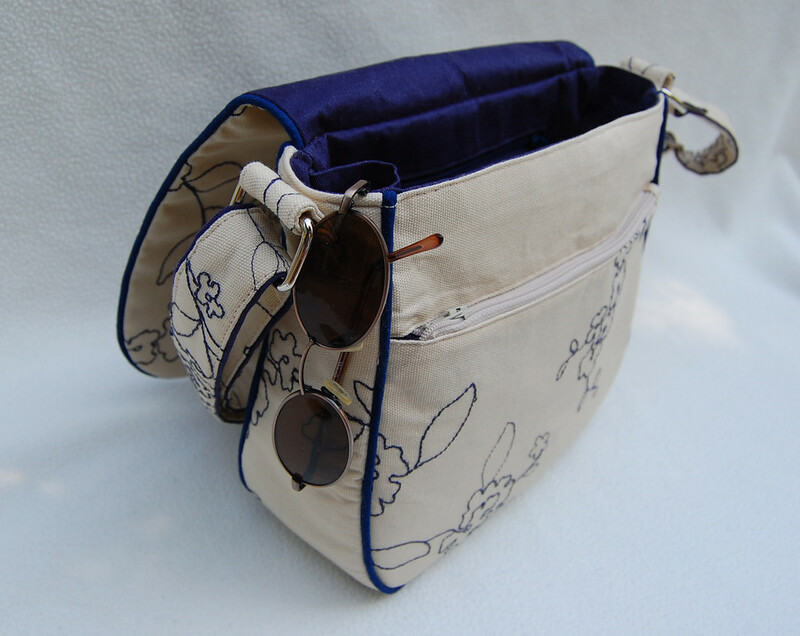 The pocket pouch need not follow the shape of the wearer's hand - it can be rectangular, triangular or square, but corners tend to collect lint over time, so curved is good. 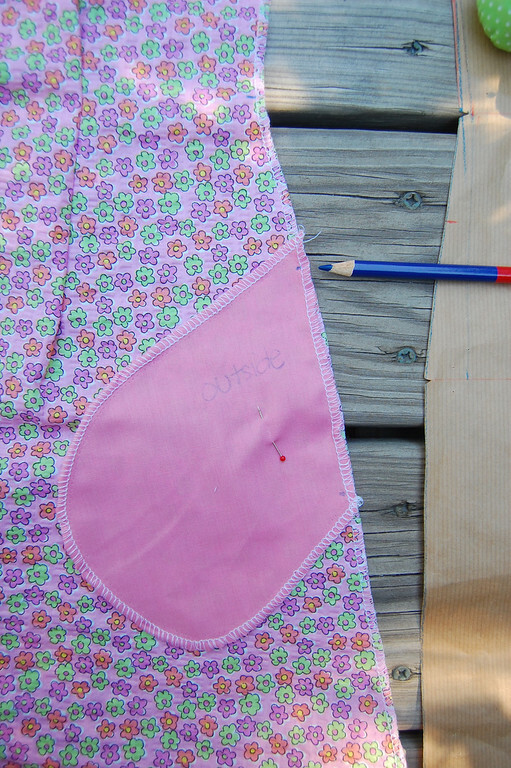 Cut out the pocket in duplicate and serge/finish the entire perimeter of both pieces. 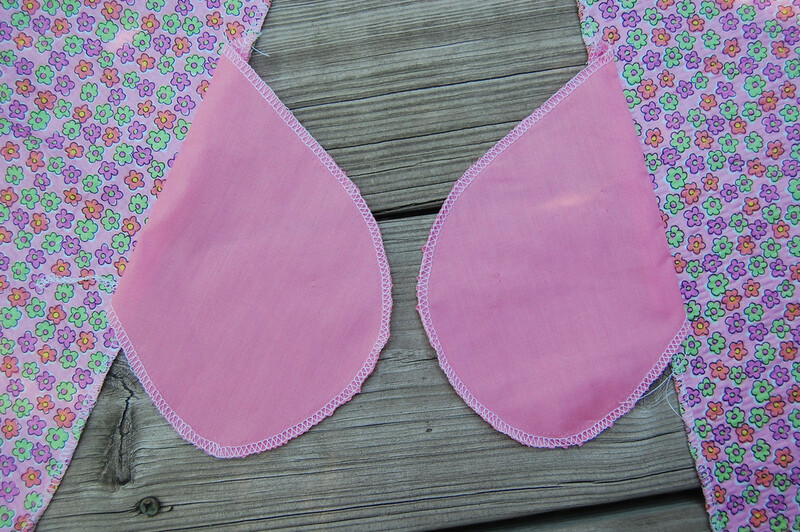 Decide where on the side seam (or any seam) you want the opening of the pocket to be. All the action is going to be happening on this one seam. The blue mark at the top of the ruler is the waist position. The top of my pocket was going to be 3" below that. Mark that point, as well as the bottom of the pocket opening. 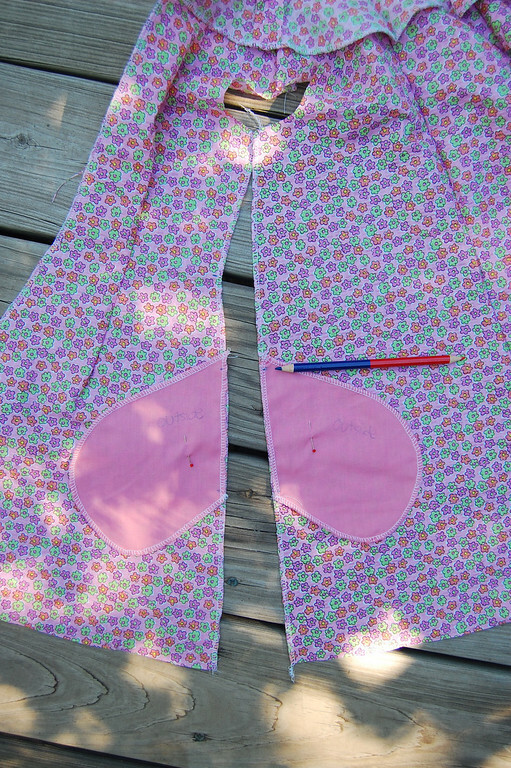 Pin the pocket in position along the side seam, with the right side of the garment facing the inside of the pocket i.e. the right side of the pocket piece. Transfer the points you marked in step 2 to the pocket piece. Repeat for the other pocket piece on the other piece of the garment that will form this seam. 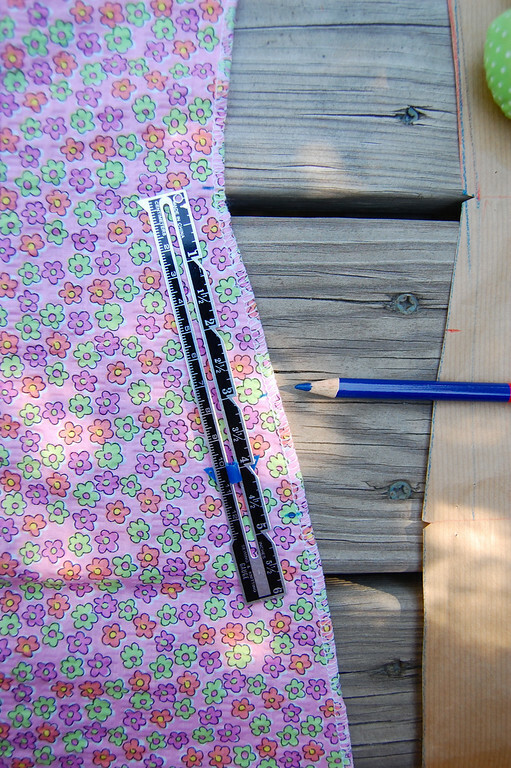 Sew along the seam line from the top to the bottom of the pocket. 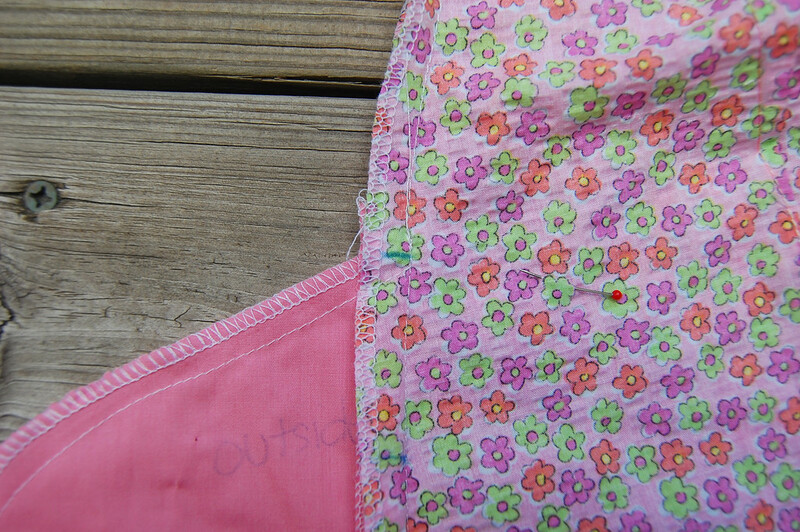 Fold the pocket pieces out and press their seams open. 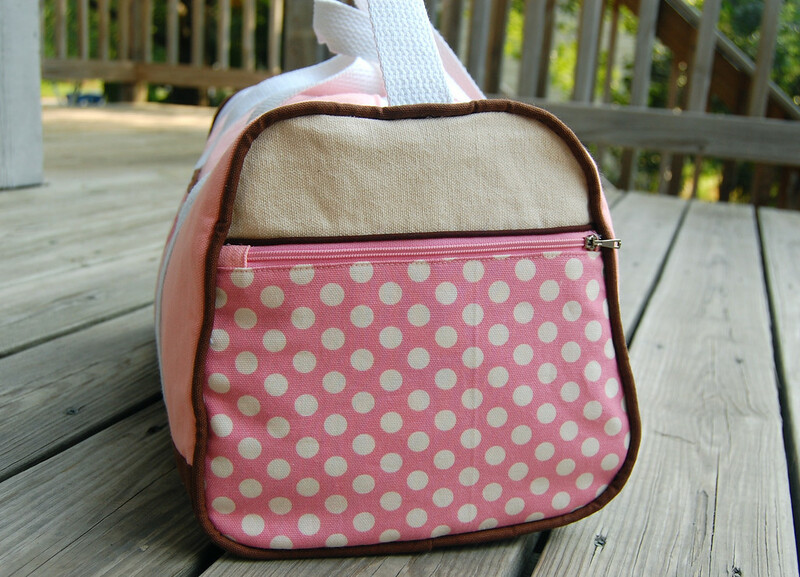 If you want to reinforce or embellish the pocket opening (e.g. 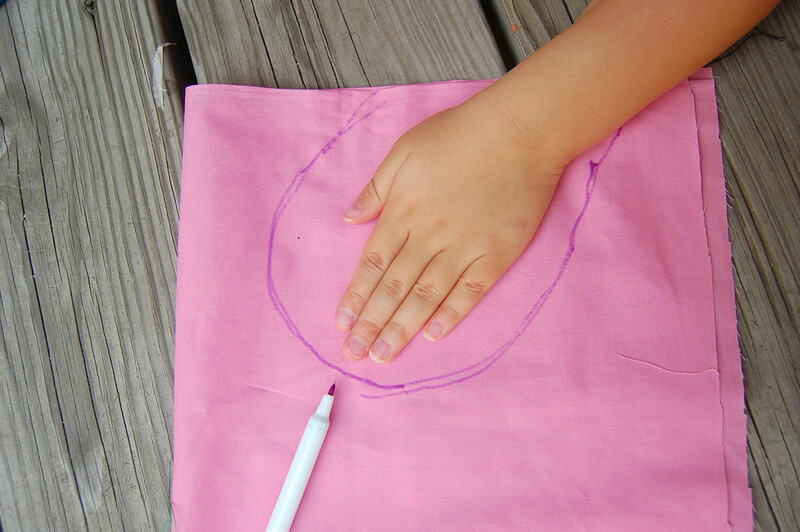 with top-stitching) or add a flap, go ahead and do it now before the next step. 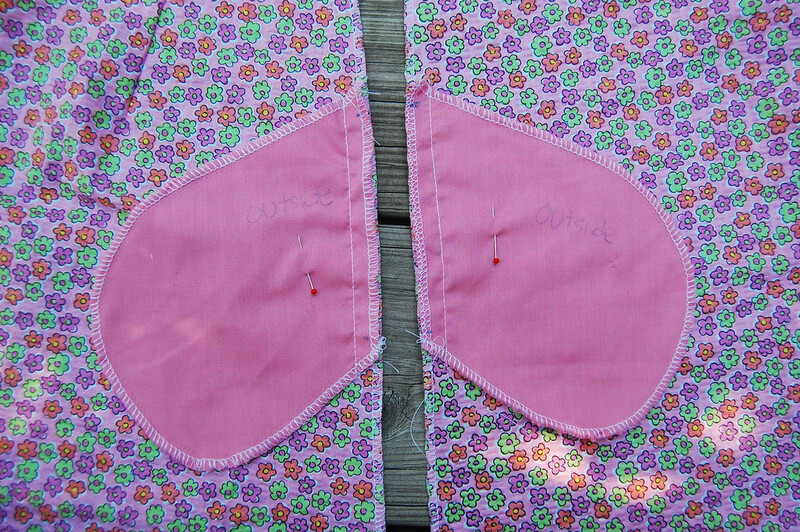 Pin the pocket pieces together, right (insides) sides together, so the garment pieces are also right-sides-together. Finish the rest of the seam of the garment. When you come to the pocket pouch, make a detour! 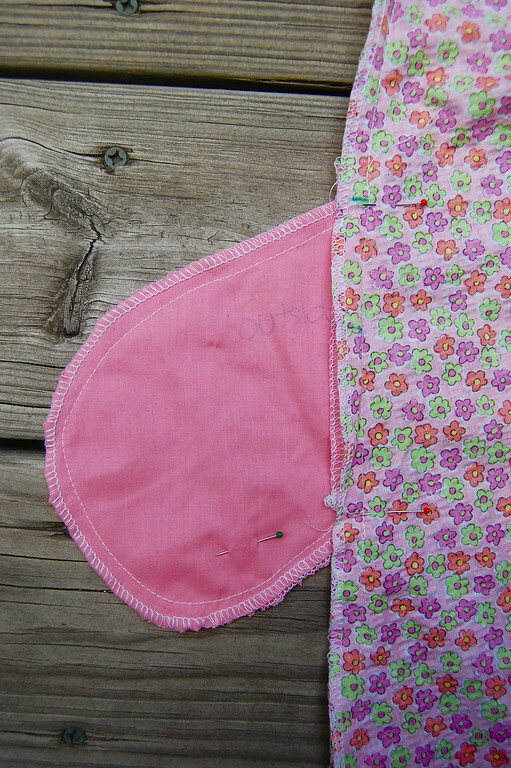 Sew around its perimeter, starting at the top of the opening all around to the bottom of the opening. These are the points you marked in step 3. Then continue sewing the rest of the seam of the garment. Finished! Turn the garment right side out and pat yourself on the back - so cunningly fancy and yet so easy! There isn't a whole lot of variation to the inseam pocket because it's entirely concealed. 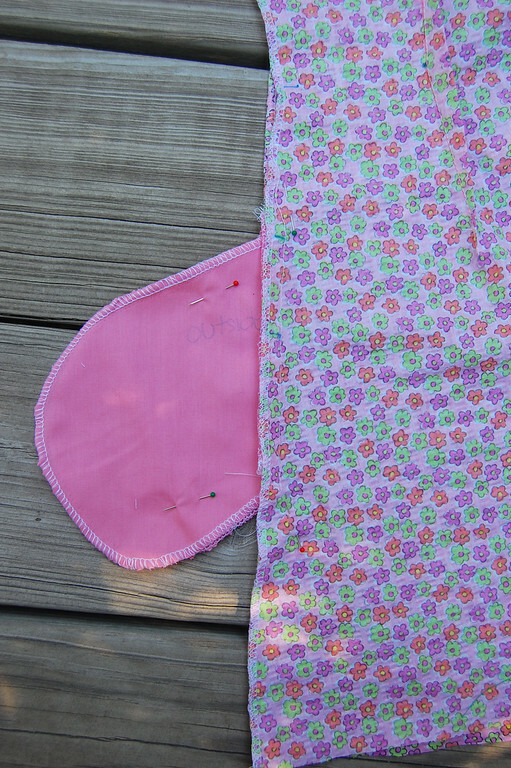 I mentioned earlier that you could add a decorative flap to one side of the seam before Step 3. This is so reminiscent of the Kate Greenaway Dresses I wore as a child. Famous for "hide-away" pockets. This seems so easy. 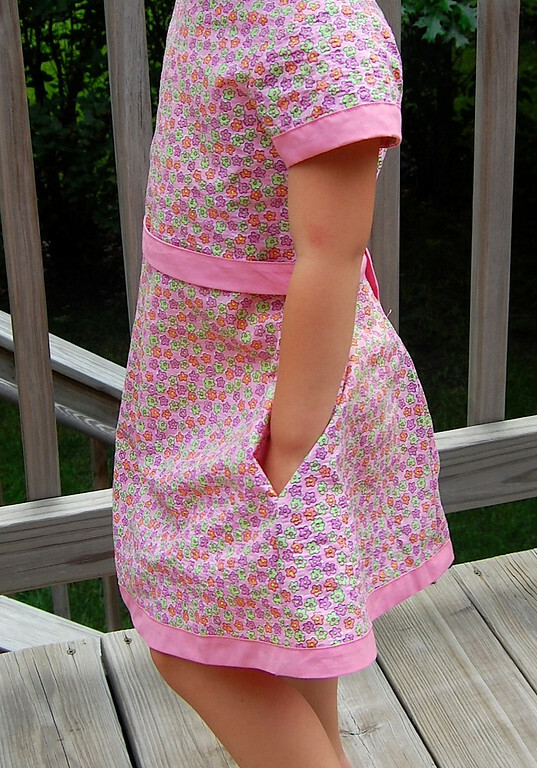 I will try it on the next dress I sew for my daughter. Thanks for the tutorial. This the pocket I've been watching for. Thank you for the photos and the simple, clear instructions. There shall now be pockets in future skirts and dresses. 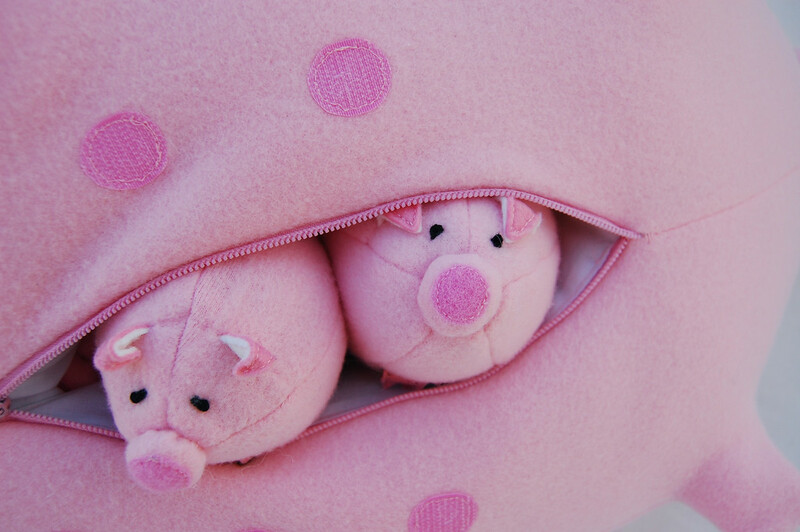 How do you do the zippered ones?